This flowering vine sports bright yellow blooms with dark dimpled eyes. A vigorous grower, it trails to 4' and is covered in nonstop bloom! 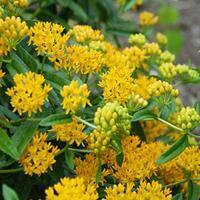 We love the brilliant orange butterfly weed- a classic native flower, but this golden yellow form is just, well, the icing on the cake! Bees love them, Monarchs have to have them, and you will feel great for helping our pollinators. A taprooted plant that emerges late in spring, put up your "do not disturb" sign to mark their spots. March and April ship dates may ship as dormant plants. Introduced in 1907 and listed in a 1923 catalog, 'Golden West' has large, single, cup-shaped flowers of sunny yellow with orange centers. Scatter seed in crevices or in a sunny rock garden to take advantage of its willowy wildflower look. Self sows. Large extra-double flowers of soft pink on cream. A new variety and lovely at the garden?s edge or among irises with masses of blue woodruff. Self sows. Part of the Thai Silk series. XL says it all-extra large 3” ruffled blooms in a cheery sunshine yellow bloom in summer atop a mound of gray-green filigree foliage, attracting pollinator bees while repelling browsing deer. Free-flowering, it tolerates summer dryness better than many flowers, lighting up well-drained border edges and slopes with sunny color. 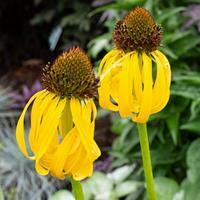 This age old favorite has bright yellow, 1 inch long flowers that have delightfully fringed upper petals, fancied to be a bird's wings in flight. They look, to me. like little orchids. The vine climbs on strings or fine trelliswork to a height of 8-12'. It was introduced to England in 1755 from its native Peru. Listed in an American seed catalog in 1903. A supreme cutting celosia from Japan that also shines in the border, the long silky plumes of pastel lime green tempering vibrant orange or hot pink summer flowers. A heat loving annual. We always look forward to when the mums bloom around here and are glad we grow so many, for bees and butterflies swarm to these last blooms of the year, including a few tardy Monarchs. 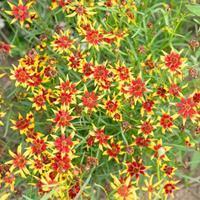 This hardy cultivar grows up to 3 feet but can be pinched once in early summer (June) for a more compact bushy habit. Buds appear a dusty rose-pink opening to soft yellow in fall with a lingering blush of pink. A lovely carefree flower, this heattolerant annual shows off a wonderful selection of ringed flowers in bicolors of cream, claret, burnished red, and gold shades gracefully waiving atop wiry stems. Cut for continued bloom or shear midseason to renew. Grow in drifts in front of a low garden fence. Known as Calliopsis since its earliest appearance in cultivation in the 1800s, and valued then as a dye plant, its graceful weaving nature and easy growth has made it a mainstay of casual, wild flowery gardens today. This selection has narrow quilled petals in varying combinations of gold and purple-brown. Bright semi-double flowers enliven subdued pink and purple hued color schemes. Bees are attracted to yellow flowers and these will not disappoint. Deadhead or shear midsummer for a continued show. Self sows. An improvement over the heirloom yellow cosmos that often starts blooming just a few weeks shy of frost here in zone 5b. 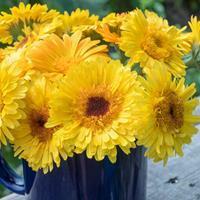 This new freely blooming variety is compact and blooms early too. 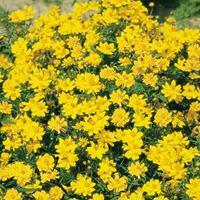 It has charming soft yellow flowers with single or collarette rounded petals. This award winner is a feather in the cap of breeder Rob van der Voort! Introduced in 1798 from its native Mexico, this golden yellow daisy flower looks very much like a small black-eyed Susan with short petals and a big brown eye. They are covered with blooms all summer. The stems, trailing to 2', have a billowing effect, which lends an informal atmosphere to garden edges and containers. Fragrant fully ruffled blooms of soft lemon yellow face heavenward, inspiring gardeners to call it ‘Angel’s Trumpet’. Tropical in effect, it becomes a shrub in warm summers and offers its evening scented blooms midsummer to frost. Poisonous. Thank you Tina, for finding this large (4”+) flowered pure yellow Evening Primrose with a trick up its sleeve. Weedy looking during the day (it is best to site it with shorter flowers in front to hide its awkwardness), it sheds its common look when it literally bursts into bloom in the evening hours. The star of many a nighttime garden party, attracting revelers and also night flying pollinators, the flowers pop open in under a minute from tightly furled buds. Sow two years in succession for a yearly show and be sure to deadhead to prevent self sowing of off-types. This lovely, sweet citrus-scented flower has yellow and white flowers, bicolor too. Could this be the "gold-striped" variety described in 1884? An early evening summer bloomer that stays open all night to greet you in the morning with sunny color.